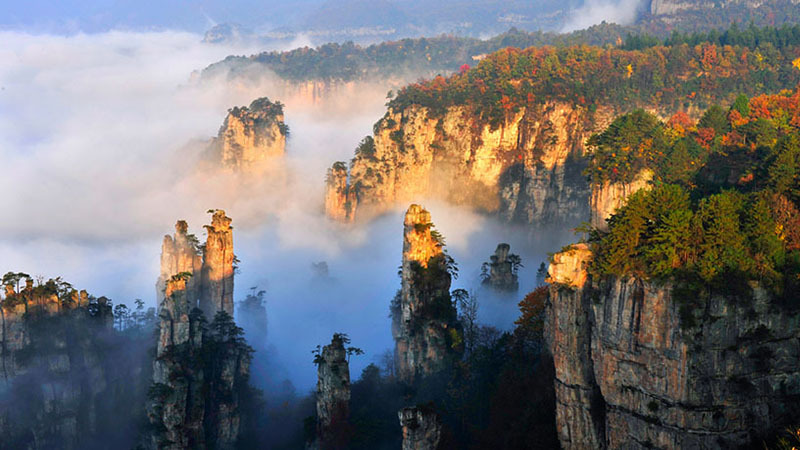 Zhangjiajie National Forest Park is famous for its unique peaks, tranquil water and beautiful green forests. Its main scenic spots include the Golden Whip Stream, the Yellow Stone Village(Huangshi Fort or Huangshizhai), Yaozi Fort( Yaozizhai) and so on. Here,numerous pinnacles rise abruptly from the level ground in the shape of huge bamboo shoots pointing to the sky. Tianzi means ‘the Son of Heaven’.The name of ‘Tianzi Mountain’ came from the story about Xiang Dakun, a famous leader of Tujia Ethnic in the early Ming Dynasty(1368-1644). It was said that Mr Xiang Dakun led the local people to fight against the government officials,he called himself ” Tianzi” ,and local people called him “King Xiang”. So the mountain had been calling”Tianzi Mountain”since that time.